I love your site! Just bought the book for us and my daughter — we share your recipes back and forth when we try good ones. Haven’t had any bad ones! 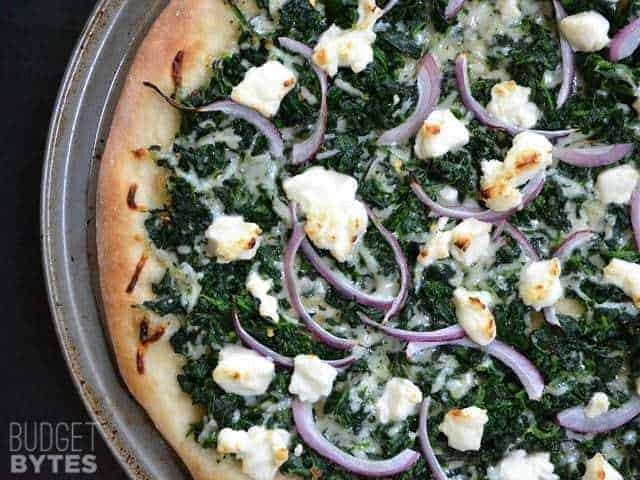 Two of our favorites from your list are White Spinach Pizza and Chili Pasta. Big favorite is Dragon Noodles! I’m looking forward to trying other from your list. Pretty good list, I think. 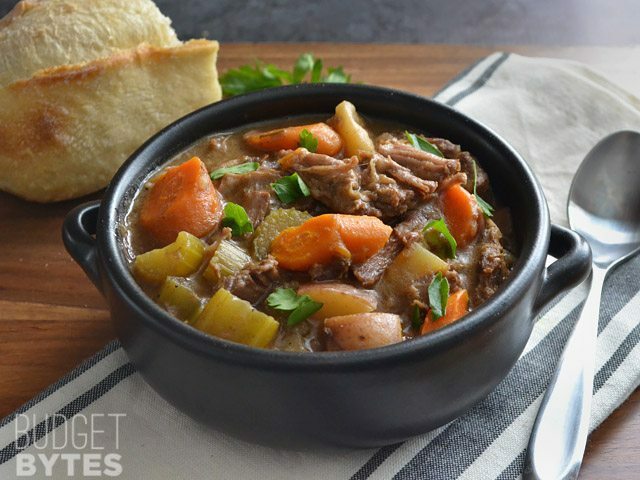 Really hoping to see more slow cooker meals this year that don’t involve beans. My boyfriend wants me to cook practically everything in the slow cooker but won’t eat beans. Thanks for all your hard work, we all appreciate you so much! We LOVE your recipe for Kung Pao Chicken and Vegetables and it’s on our menu rotation twice/month. Easy, fast and delicious! Wow I make recipes from your site ALL the time and i’ve only made a handful of these. Beth I would like to thank you because not only have you helped me making delicious meals while keeping my wallet intact, But I honestly think i’ve become a much better cook in the process. I’ve learned so much about cooking following your simple processes. So thank you and keep up the amazing work. 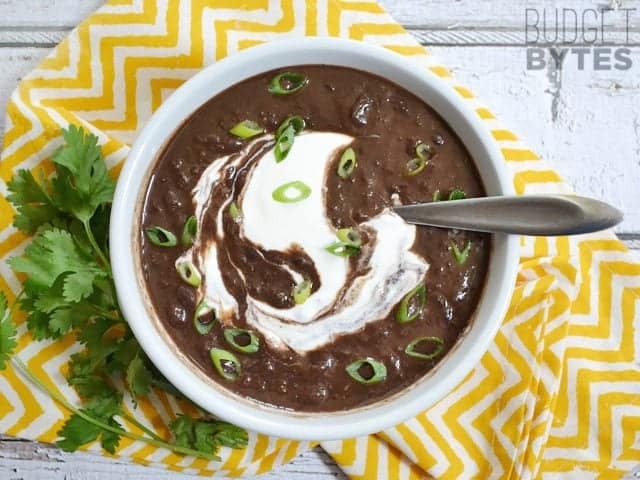 The black bean soup is on my short list of things to make. The soy dijon chicken thighs, vegetable polenta, and sweet potato tortilla soup have all been in regular rotation at various points this year. I can’t thank you enough for your blog – it’s expanded my horizons and confidence in the kitchen without breaking the bank. I look forward to a delicious and budget friendly 2015! AFRICAN PEANUT 4 LYFE! Best recipe ever. Beth- I just wanted to let you know I ADORE your website and recipes. As a Johnson & Wales almost grad (3 years of Restaurant Management) I have a pretty selective palate but also a fairly limited budget. I’ve told everyone I know about your website and I am getting into the rhythm of meal planning and prepping. I really love sharing what I’m eating with my classmates and making them jealous. Your pizza has impressed guys and the chicken picatta is SO delectable. Nothing like the “Mmm” from a non-cooking graduate student to make one feel satisfied. Thank you for all the effort you put into your site. It has improved my life immensely! The sweet potato chorizo skillet quickly became one of my absolute favorite. I made that a lot this year. I’ve made and enjoyed most of the ones on the list though. I’ll have to try the others. Budget bytes became my go-to recipe source shortly after I discovered it and started making a few things. Southwest Chicken Skillet is a great recipe. Made it a few times along with substitutions based on what I had on hand. Your recipe performed great every time and produced hardly any dishes. Would definitely recommend this as an easy week-night dinner. Sausage and Kale skillet is my fave of 2014. I use turkey sausage and substitute great northern or cannellini beans instead of chickpeas, and serve over pasta.